This large vintage serving plate. I'd been admiring one from a nearby antique store for a while, and I found my own in better condition for $1.00. In warm tones (my favorite) and a loose 50s illustrative style we see glimpses of Paris, Rome, London, Spain, Egypt and Japan. Can anyone ID this plate? 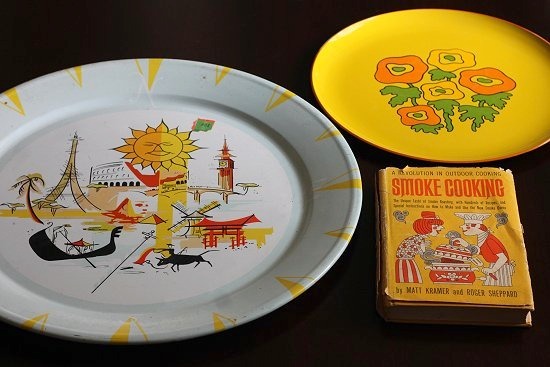 Speaking of warm tones, I love how yellow and orange is the theme for these three finds. I found the yellow and orange flower plate at Goodwill and the cook book at the flea market. 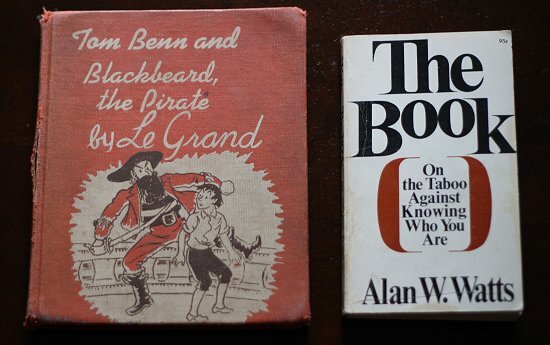 Forever a sucker for vintage children's book illustrations, I had to scoop up the 50s Black beard the Pirate book. The Alan Watts book from the same vendor looks like it will be an interesting read. 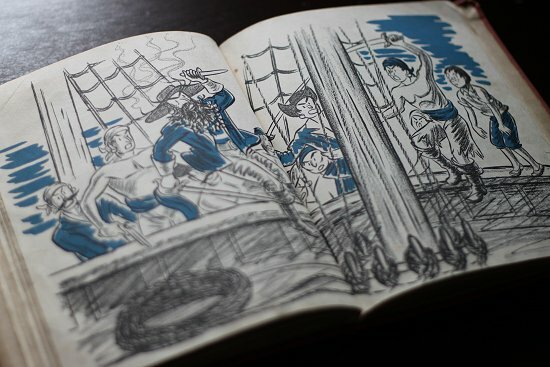 I love the illustrations in this pirate book! I want to make time to scan every single page from it. 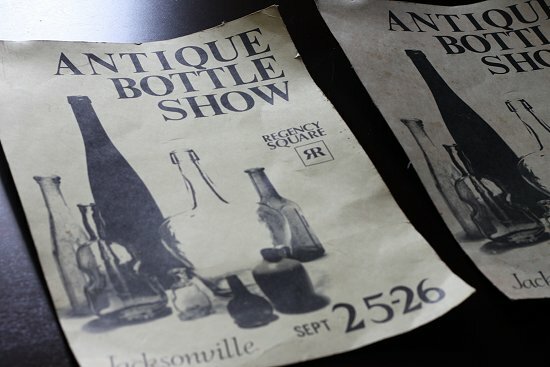 Sandra, an old friend of the family had a booth at the flea market and kindly gave me these vintage Jacksonville Antique Bottle Show fliers. I intend to keep one, I love finding vintage pieces that tell the story of my city. Sandra tells me she has a wealth of vintage for me to dig through and buy, I can't wait to take a peek at wares! I almost passed on this Wall E piece, most likely a lamp. But for 99 cents at Goodwill it was a good deal for a little pop culture goodie. 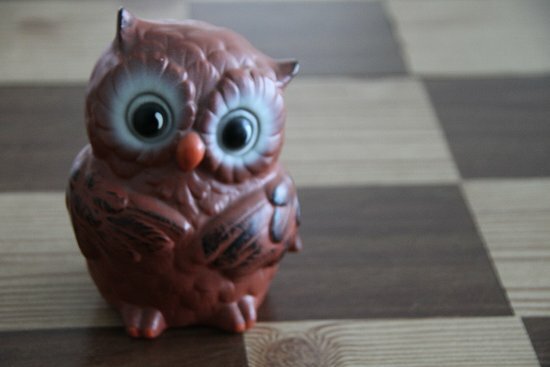 This cute vintage chalkware owl was a treat from Trilas' booth at Southern Crossing antique mall. At $5 I was wondering how the hell stayed in the shop for so long. I suspect he loves to singa like the owl from the beloved Merrie Melodies cartoon. By the way: There have been requests for link share on Thrift Core. I've started a Sunday Goal Share + Giveaway where we can inspire each other to keep on top of goals, resolutions, and reselling progress. Would you like a Thrift Haul link share too? I am excited you are starting a new linky and goal share. 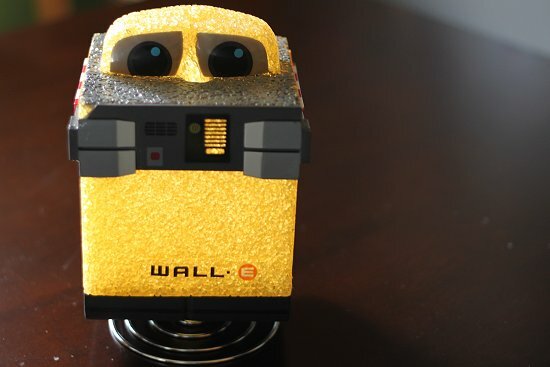 I am sad that Wall-E is sold because I was going to make you an offer. 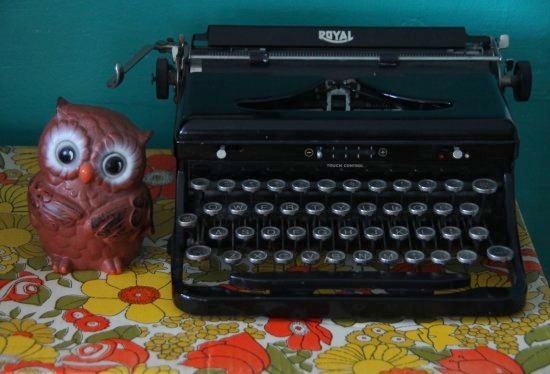 You have had some influence over me as after Christmas I did lug home a very heavy "portable" Olympus typewriter. Could not pass up the price and I saw a post where, if nothing else, I can pot a plant into it. Adding your new party to my links right now. Great finds for the New Year. Thanks for shopping my booth again. I thought that owl would go quicker then it did. The other three owls I put in the booth with it sold fast. We hit the Flea Market this weekend too, it's so much fun because you never know what you might find. Love all your finds. Like that yellow flowered plate! Oh my gosh that owl. He looks like he's ready to ask for a hug. Too cute. That serving plate is nice too. It's almost a shame to cover the image with cheese and crackers, lol. Van - You have the best owl mojo! I've been doing pretty well lately, and am planning to go back out again today. I've yet to find that illusive super cute owl though! I'll keep looking. Wow, already? And what a great first haul too:) Very nice! I know what you mean about the appeal of those warm tones... Great finds! I also cannot resist vintage kids books. Happy New Year Van! Very nice finds. I wish I could help you ID the plate, it is fabulous! Trilas: It's a mystery for sure, I kept seeing it on the shelf when it should have been purchased. I'm glad it's mine now! Helen: I love the flea market because it's cheaper. I just got back from a thrift store half-off sale and all-in-all, still paid more than flea market/yard sale prices! Jil: It's a little scratched, but a steal at 49 cents. Jackie: Indeed! I wonder if the person who buys it will display it instead. Lori: Me too, I shall try to stick them in the shop today. I hope they move soon! Dogs or Dollars: They seem harder to come by these days. You'll find one eventually, keep hunting! SixBalloons: Thank you! 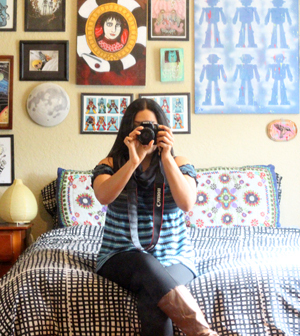 :) Warm tones are just immediately energizing and uplifting! love the wall-e lamp; not surprised that it went so fast! i found some great things on my trip to ottawa that i will post later today or tomorrow. i love thrift-haul links because it's fun to see what people find. one of my goals for 2012 is to start reselling, so a link to that kind of share would also be helpful for a newbie like me! totally love that yellow tray from goodwill! we had one similar to that a while back. and yes, I know what you mean about wanting to scan every single page of a book! 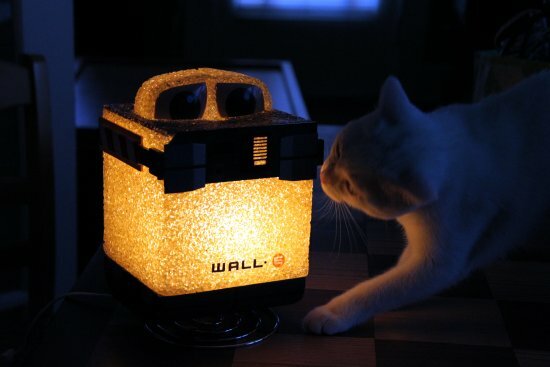 The Wall-E lamp is too cute! Not something I would personally collect, but something my boyfriend may trample me for. I've got my egg lamp for my side of the bed, he can have Wall-E for his! Thrift Haul link up would be the best link up! Been meaning to link up to your first inlinkz, but, I've been so busy trying to meet my goals. Looks like you got some great stuff! I am on vacation now and can't wait to get back home for my last serious thrifting extravaganzas before the new school semester starts! I feel like I don't really count in days anymore, but I have 2 great thrifting weekends before school and work starts up again! Thrift Shopper for Peace: I think the weekly goal share would be helpful for that, we could share our progress with reselling goals. Leah: I have a pile of vintage books to scan, actually...I need to schedule time for that. Chelsea: Good luck on your hunts before school and work start back up! Channy: He's a super adorable piece! 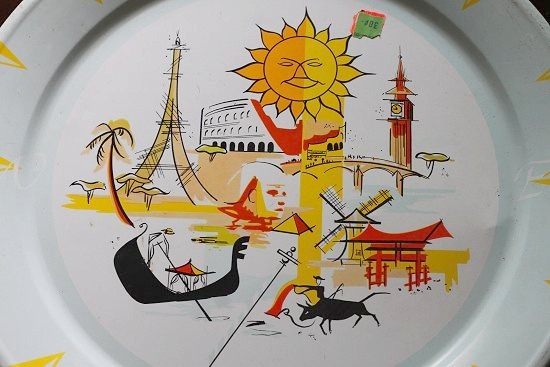 love the illustration on the serving plate!